HP has quietly made its refreshed Spectre x360 15t Touch convertible notebook available for pre-order. Each model comes standard with an 8th-generation Intel Core i7-8550U and Nvidia’s dedicated GeForce MX150 coupled with 2 GB of GDDR5 VRAM. Also standard is a 15.6-inch 4K UHD touchscreen display. Users have the option of configuring the DDR4-2400 system RAM up to 16 GB and PCIe SSD storage up to 1 TB. It will ship with Windows 10 Home 64, although it can be pre-configured with Windows 10 Pro 64 for an additional US$70. As we have highlighted, the Intel Core i7-8550U powering the next Spectre x360 is built on the Kaby Lake-R microarchitecture. It delivers up to 40 percent more performance over the 7th-generation component it replaces due to an upgrade from two cores to four cores. To keep the Core i7-8550U suitable for ultrabooks like the Spectre x360, Intel has kept the thermal dynamic profile at 15 W and lowered the base clock speed. In this application, HP has set the base clock rate at 1.8 GHz, although this can ramp up to an impressive 4 GHz for short bursts under load. 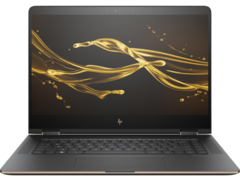 Casual gamers who have been waiting for a gaming ultrabook will rejoice that HP has fitted the new Spectre x360 with Nvidia’s new MX150 dedicated GPU. It features Nvidia’s latest Pascal architecture and packs in 384 shader cores with a 64-bit memory bus. Its 25 Watt TDP should help to deliver a good blend of performance without sacrificing too much in battery life. Our real-world testing shows that while it can only deliver up to 25 fps on the highest settings in demanding games like Rise of the Tomb Raider, it will suffice for strategy games and less demanding 3D titles. The MX150 supports DirectX 12, OpenGL 4.5 and Vulkan. When it ships next month, the HP Spectre x360 convertible notebook will retail from US$1279. There is no word on its availability or pricing outside of the US at this time.